Four months ago he was still a dot. Roughly the size of a sesame seed. Now he has grown. Oh how much he has grown! At 24 weeks he now weighs more than a pound and his length from head to rump is approximately 11 cm... longer than an IPad (yeah even the new IPad!). See his fingers? You have a good eye if you can recognize that in the above ultrasound scan he is sucking his thumb. Isn’t that cute? Uh yes, it is a boy. Oh well rephrase that; He is a boy. We found out right away as he was not at all shy to show his jewels, which made my hubby very proud. Ooops I am not talking about what Harley had to do to me. What I mean is that our doctor had to poke me to check if there was anything wrong with my reproductive organs. As far as I can remember my menses were never regular. So when we decided we were ready to have a baby mid last year, we sought the help of a reputable fertility doctor early on. He was recommended by a family friend. Harley and I underwent some tests and thank God we were both declared normal and fit to have a baby. I was prescribed with injections in order to ovulate regularly. Though our doctor pronounced with conviction that he did not see any reason why we would never conceive, but patience was never my strength. The wait was a roller coaster ride of emotions. I became snappy at well-meaning friends who showed concern because it was taking us time to hit the jackpot. I became frustrated at my father in law who asked me for progress every single time I talked to him. (At the back of my mind I knew that to pressure me was never his intention. He was just as impatient to have his first grandchild.) I even threw dramatics at my poor husband, asking him many times if he would still love me if it would turn I could never get pregnant. I blame it on the medications I was under. They were surely wrecking my hormones. But I should have relaxed and placed my trust in Him as everything has to happen at the right time. Last year my husband’s mother (who is working here in Kuwait) was diagnosed with stage 3 breast cancer. When she started her treatment in August 2011 she of course desperately needed our support as her husband was not here (he works in Africa). We all tried our best to be there for her. But it was tough, and what was tougher was seeing her suffering debilitating pains because of the complications of the chemotherapy. There were many times when we felt helpless. The pressure was stronger on my husband as he tried his best to step up, to be the man in the family. My mother in law completed her chemotherapy sessions by mid December 2011. I decided to take a home pregnancy test in January when I realized I missed my period. And the result? Well I had to pinch myself and was shaking when I showed to my husband the big fat positive - the two lines of Hallelujah! The pregnancy blood test I had the next day confirmed it. See, everything happens in God's perfect time. Mother in law has since recovered brilliantly and her health has improved dramatically. In fact she is back to work and looking better than ever. 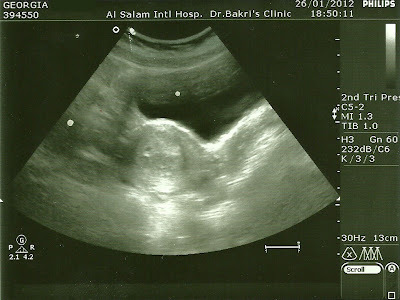 And I am pregnant! Now, I am entering my 6th month and I am enjoying every bit of it. 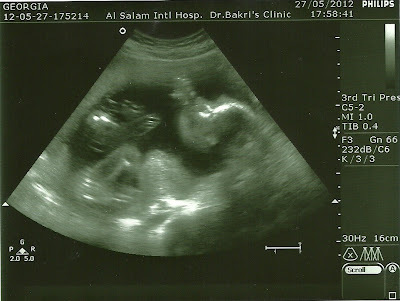 I am proud to have survived the difficult first trimester - the sicknesses that happened not only in the mornings. Oh I don't care about these breakouts on my face. I don't care that my tummy is itchy most of the day. I don't care that whenever I see myself on the mirror, I am sure my nose is getting bigger. 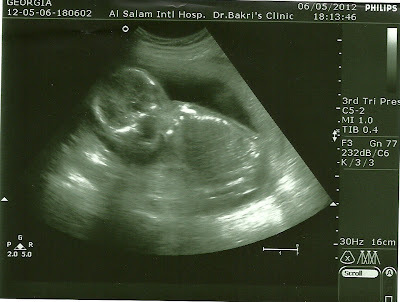 Well, I am having a boy after all. But I don’t care. To experience life growing inside of me, his kicks and jabs as if to remind me of his precious presence, his increasing weight... these are just too priceless. Oh yes, I am enjoying my pregnancy. I love the comforting feeling that my son is with me, inside of me, 24/7. I feel so blessed. Being alone is such a foreign feeling now.